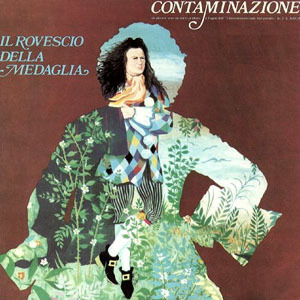 Among the favorites of Classic Italian Prog fans, Il Rovescio Della Medaglia came from Rome and were found in early-70's by guitarist Enzo Vita, bassist Stefano Urso, drummer Gino Campoli and singer Gianni Mereu, who's place was taken soon by Sandro Falbo and then Pino Ballarini.Their performance at the Viareggio Pop festival marked the band as a live monster and the first two albums, ''La bibbia'' (1971) and ''Io come io'' (1972) are good examples of dynamic Hard Rock.They reached their pinnacle though the following year, when RCA came in contact with Argentine composer Enriquez Bacalov (the same man who helped New Trolls) to dress the band's music with his arrangements.By the time they had added Franco Di Sabbatino on keyboards and the result of the recordings was the ''Contaminazione'' album, released in 1973 with lyrics written by Sergio Bardotti and Giampiero Scalamogna. ''Contaminazione'' follows the trends of the time, it's an album heavily inspired by Classical Music, resulting to a work of complex Prog Rock with hard-edged guitars and keyboards in the forefront, obviously linked to NEW TROLLS ''Concerto grosso'' due to Bacalov's presence and the dominant display of some powerful string sections.On the other hand they had surfaced with their own identity, while ''Concerto grosso'' was much more of a harmonic and well-flowing release, ''Contaminazione'' is characterized by a dark atmosphere, ranging from melacholic lyrics to mascular guitar attacks.Split in 13 tracks, this album flows as a single suite with monster orchestral arrangements and excellent keyboard parts, including Hammond organ, piano, harsichord and synthesizers, evolving from Classical themes with a sweet atmosphere to complicated keyboard parts with a very dense and compact sound.This one grows with every listening, as every single part has its own approach, it often comes close to the works of LATTE E MIELE, trying to combine romantic tunes and interludes with Symphonic/Hard Rock.The vocals are absolutely great, mostly delivered in a sentimental tone and placed between the complex instrumental passages for a more balanced sound.Cinematic textures and early-60's Psych influences are also detected in here, but the bulk goes for keyboard-based Symphonic Rock with some beautiful dual executions and the usual presence of electric guitars around. The band played live also in France and Switzerland, the later country became the home of Pino Ballarini in late-73', replaced for a few concerts by Semiramis' Michele Zarrillo.After an English version of their classic in 1975 the band fell apart to be reformed twenty years later by Enzo Vita, leading to some more studio releases, far from the classic style of Il Rovescio Della Medaglia and closer to a more AOR/radio-friendly sound. ''Live in Tokyo'' though, released in 2014 on Immaginifica, offers a good live take by the recent formation on the classic ''Contaminazione'' album. Very good Classical Prog with some emphatic keyboard and string arrangements, almost a classic of the genre, twisting between cinematic and haunting soundscapes.Strongly recommended...3.5 stars.